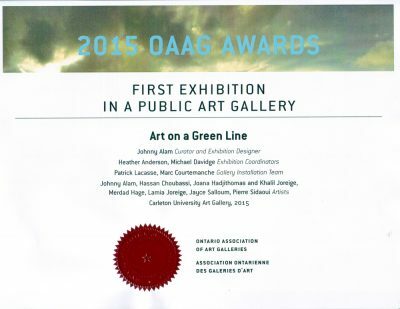 PhD candidate, Johnny Alam, recently won the First Exhibition in a Public Art Gallery award at the 38th Annual Ontario Association of Art Galleries (OAAG) awards ceremony, held at the Gladstone Hotel in Toronto. Alam’s exhibit Art on a Green Line explored artistic responses to the Lebanese Civil War. His innovative exhibition, Alam’s first, was presented in the Carleton Curatorial Laboratory, a gallery space dedicated to the development of curatorial practice in Carleton University’s Art Gallery.